One of the current programs at the University of Chicago's Doc Films is a partial retrospective of work by the great French filmmaker Alain Resnais, who passed away in March. The series, which wraps up Wed 6/4 with a screening of the recently restored Je t'aime, Je t'aime; in advance of Doc's presentation, the Gene Siskel Film Center screens the film on Mon 5/26, which gives Chicago moviegoers double the chance to catch one of the director's rarest films. The partial retrospective was especially interesting because it forewent the director's two most canonical films, Hiroshima, Mon Amour and Last Year at Marienbad, giving Resnais novices the opportunity to get better acquainted with his work. For the past few weeks the Reader's film sections has been particularly captivating thanks to the great archive capsule reviews of Resnais's films. And on the Bleader Ben Sachs has been posting some great stuff about the director. Initially, I was reticent to list my five favorite Resnais films because his oeuvre seems so untouchable, much like Godard's, Dreyer's, Ozu's, or Bresson's. But all the great writing sort of propelled me; you can catch my five favorite below. 5. Stavisky . . . (1974) Perhaps his most polarizing film, misjudged by the intellectual film community of its day as a shamelessly mainstream, impersonal effort. True, it's not his most subtle or cogent narrative, but the film is a masterclass in montage, dissociative yet completely resonant. Resnais was also a strong director of actors, and here he gets more mileage out Jean-Paul Belmondo's mug than even Godard did in Breathless. 4. Providence (1977) A whimsical experiment in narrative and intertextuality, Resnais's first English-speaking film is among his most affectionate works. The "puzzle-like" aspects include a series of internal editing sequences that give the film a metaphysical tone; in one instance, a character enters the room, and over the course of a single take, the contours of the space changes as the camera tracks their movement. The effect is transfixing, Resnais's way of getting to the heart of narrative through imagery. The bipartite structure also clearly influenced David Lynch. 3. Muriel (1963) According to Dave Kehr, this "surpasses his better-known Last Year at Marienbad and Hiroshima, Mon Amour in terms of intricacy of construction and sensitivity to shades of memory and regret," and though I don't necessarily agree, Muriel is still worthy of being considered as inventive and elegantly structured as anything he's made. It's sort of a touchy film, but its enigmatic themes and self-reflexive nature reward repeat viewings. 2. Statues Also Die (1953) Codirected by the great essay-documentary filmmaker Chris Marker, this 30-minute short is the first great work by either director. Resnais and Marker initially set out to make a simple doc about African art, but as they collected footage and researched the subject, they were confounded by the fact that African art was housed in the anthropological museum Musée de l'Homme, not an art gallery like the Louvre. The project eventually morphed into a commentary of colonialism and cultural subjugation, and today the film stands as a testament to film as a conduit for mental processes—ideas, dreams, memory—in motion. 1. 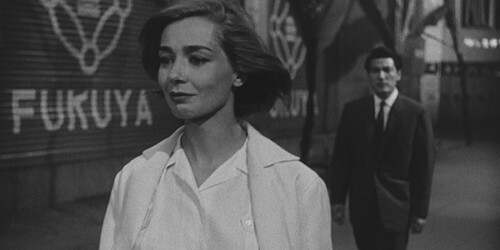 Hiroshima, Mon Amour (1959) The archetypal art film and a key influence on filmmakers as wide-ranging as Steven Soderbergh, Dusan Makavejev, Nicolas Roeg, Terrence Malick, and John Boorman. Its classic status is undeniable, which is both a good thing and bad thing, as it is for any canonical work. New audiences might have a hard time batting away its reputation to get to the work itself, which is essentially death for a film like this because so much of its power lies in its experiential qualities. But Hiroshima, like so many of Resnais's films, is designed for repeat viewings, so a determined viewer doesn't exactly have the cards stacked against them.